through, but there is agreement on all the main points. branches, as listed on this page. those rivers (buk or nam, meaning north or south of). font-sizes 16~24 (this does not apply to the "bypassed" peaks). northeastern border of Korea with China (and Russia for 10 miles). 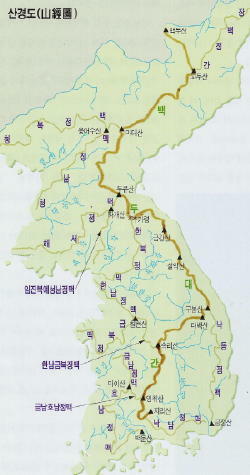 north-central and northwestern border of Korea with China. Note: the Daedong River runs just south of this branch. by Seongji Munhwasa Publishers, Seoul. focused consideration of multiple sources. doubt, I have used "-san". don't yet have very exact and reliable information. suggestions for improvement for these listings. is finally available for hikers and cultural-explorers!